Last week threw up mixed signals about the Indian economy. They gave economy-watchers some anxious moments, as they pored over the latest numbers churned out by the ministry of agriculture. The figures indicate that normal area under rabi cultivation dropped from a normal of 614.3 lakh hectares to 540 lakh hectares as of 19 December 2013 and further down to 511.1 lakh hectares as of 19 December 2014. The figures portend gloom. Some thought they could provide traders an opportunity for making a quick buck on commodity futures. After all, a decline in cropping area would imply an impending shortage of crop. The rabi crop accounts for roughly half of the overall agricultural production. Incidentally, rabi refers to agricultural crops (like wheat) sown in winter and harvested in spring. Given that the kharif output has been sub-optimal as well, according to the first advance estimates available from the same website mentioned above, there is further cause for alarm. 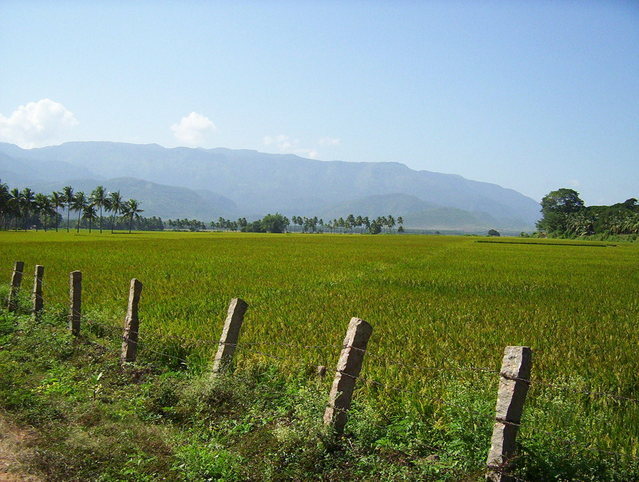 Kharif crops (like rice, millet and maize) are usually sown at the onset of the first rains in July, during the south-west monsoon season, and harvested around October. Fortunately, agricultural prices did not go up. It was possibly because the data trend provided by the ministry differed from the discernible trend provided by Economic Survey 2014 (see chart below). It suggests that the area under rabi cultivation has actually been increasing over the past three years. There might have been a fall in cropping area this year, but the trend has been positive for the past three years at least. Another reason could be that cereal consumption on a per capita basis has been declining, even though, rather curiously, rice and wheat procurement by the government continues to increase year after year. This is in spite of granaries overflowing and grain being allowed to rot. In sharp contrast, demand for millets, vegetables and fruit, milk and meat has been increasing. Additionally, vegetable and fruit production has been climbing, though not fast enough to keep pace with the demand-growth-rate (but more on that later). All these raise issues that require urgent attention. First, the government will have to look into such discrepancy in numbers provided by the Economic Survey and those put forth by the agriculture ministry. Obviously, unless the numbers are reliable, all planning could turn unreliable as well. Second, even if land under cropping has not declined, there are very good reasons why it will, and must, shrink. The planned pace of economic development, and the emphasis on manufacturing, will inevitably put pressure on agricultural land. This is because land will be required for new roads, railway lines, factories, ports and airports, and the emerging smart cities. The government will, therefore have to adopt three strategies. 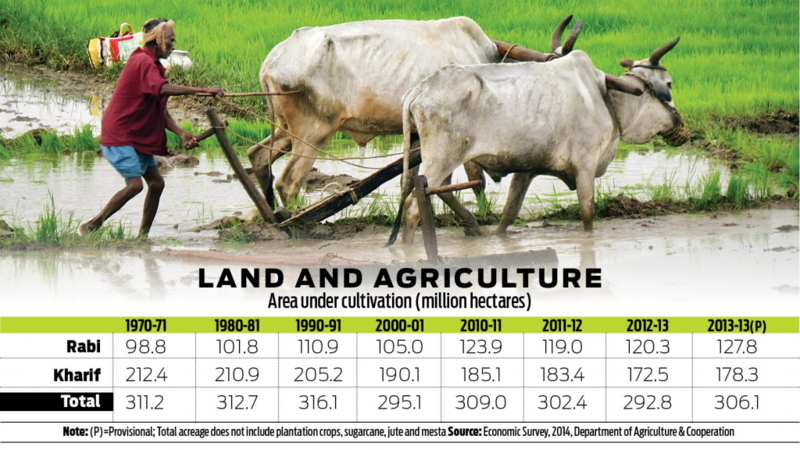 lt must bring more land in the east and the North-East under agriculture. Some of this is already happening, but a lot more must be done. lt must immediately offer arid lands to corporate or cooperative bodies (maybe patterned along the lines of Verghese Kurien’s white revolution) on long term leases of 50 years or more. This will allow for more large scale farming, rejuvenation of lands, and upliftment of people in these marginally cultivated areas. Experiments by micro-irrigation companies like Netafim — in rocky, dry, hilly terrains like Jharkhand — have shown how proper planning can make even arid lands fertile with minimum use of water or electricity. lt must follow policies like those adopted by many European countries: of not allowing any agricultural land to be used for factories or roads, till one metre of topsoil on such lands is scraped off and deposited on to neighbouring farms. This is because topsoil has micronutrients and micro-organisms that take several decades to develop. It is a shame to let topsoil get covered with concrete, tarmac or steel. Such a policy would allow for faster conversion of arid lands into fertile regions at lower costs. In addition to all this, just as Narendra Modi did in Gujarat, and as Chandrababu Naidu did in the erstwhile undivided Andhra Pradesh, the government must exhort all state governments to adopt policies that reduce use of electricity for water pumps (new tariff policies are being considered which could modify this across the country) as well as micro-irrigation. This is because water is likely to get scarcer for India. Moreover, India’s agricultural output and productivity is lower than that of China, even though the latter has less water and arable land than India. Clearly, crop, water and energy management policies for agriculture will also be required on a war footing. But could we begin with getting the right set of numbers across first?